Your requirement: To migrate your IBM® Lotus Notes® applications to a Java (J2EE) platform or ASP.Net on premise or in the cloud. Our solution: To provide software that cuts migration time and costs for maximum productivity. The CIMtrek Notes to Java (J2EE) platform or ASP.Net migration tool reduces the time it takes to lift and shift your applications and documents from Notes by up to 70%. Our system maintains 100% data fidelity and structure to: protect your existing Intellectual Property, enable quicker user acceptance and reduce retraining overheads. The software is designed to assist users in migrating more complex applications that do not fit into the SharePoint model. It therefore usually requires additional remedial work post initial migration. However, if you are migrating from Notes to - for example - a Tomcat environment, this tool is an ideal solution for simple applications and document repositories. The CIMtrek tool to Migrate to a Java (J2EE) platform or IIS .NET is exactly the same, although the generated end applications are naturally very different. Business/Application Logic: To handle the Notes application’s logic and data communication with the client via HTTP request / response protocol. Authentication & Securities for all users. All components have been written and designed for compatibility with both web and application servers. There are no additional requirements for the back end. The outcome of the J2EE process is a deployable .WAR file. For ASP.NET, it is a Microsoft project file. CIMtrek uniquely allows you to deploy and execute applications on the most appropriate platform, from full-on premise to total cloud or a hybrid environment. 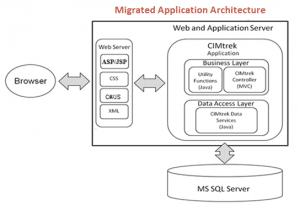 There is no ongoing requirement for any CIMtrek software once the migration is complete.